With a healthy glow to her cheeks, Gabriele Jenner stands behind the counter eager to introduce us to Jahn-Markl, her Tracht (traditional Austrian dress) shop. The sign above the door symbolically states 1408. Salzburg’s oldest former tannery was founded over 600 years ago, around the time another of the city’s great passions began—the brewing of beer. 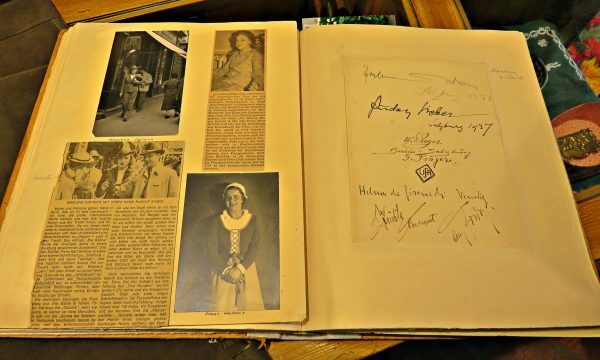 Jenner’s family traces ownership back to 1890 and she was eager to open the shop’s customer book that takes pride of place at the end of the counter to show us some of their prestigious customers. Leafing through the delicate pages, she picks out 20th century heavyweights: “Marlene Dietrich, Pablo Picasso, and Max Reinhardt, who established the Salzburg Music Festival,” she says, tracing her finger across the signatures. 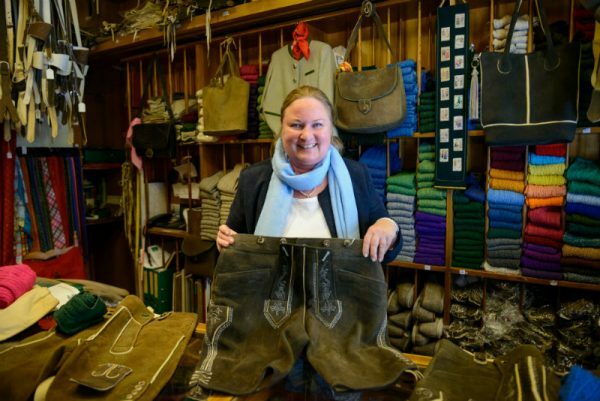 “Even Emperor Franz Josef I liked a specific dark antique-looking leather color: Salzburger Altschwarz,” she adds, pulling a neatly folded lederhosen from the shelves for us to examine. Tracht has enjoyed a real revival in Austria for some time now, and the Jahn-Markl boutique surely must count itself as part of the inspiration for the resurgence. It’s even caught the attention of major fashion designers from across Europe. Jenner retells a story of not recognizing Vivienne Westwood when she made an unexpected visit. There are also dedications from Karl Lagerfeld and Louis Vuitton in “The Book,” so it comes as no surprise that aspects of Austria’s national dress have found their way to the world’s fashion capitals. In 2014 in Schloss Leopoldskron on the outskirts of Salzburg, Lagerfeld displayed his “Alpine folklore” collection for Chanel. Outside Jahn-Markl’s shop, St. Rupert’s festival was awakening for another year and the Tracht revival was all too evident. An array of colors and fabrics carrying intricate hand-stitched embroidery designs flowed past the doorway. Visitors from all across Salzburgerland were congregating in preparation for the opening ceremony. 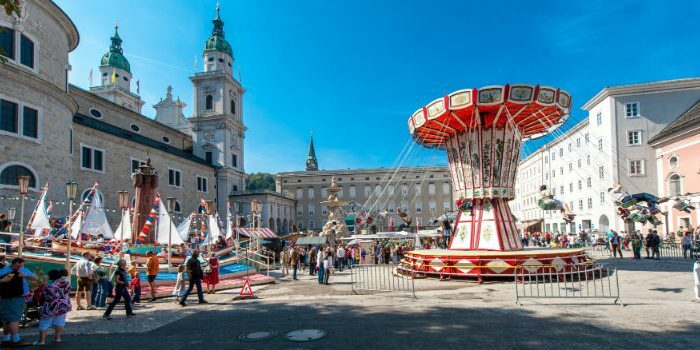 In honour of St. Rupert, the Patron Saint of Salzburg, the fair celebrated its 40th anniversary this year. 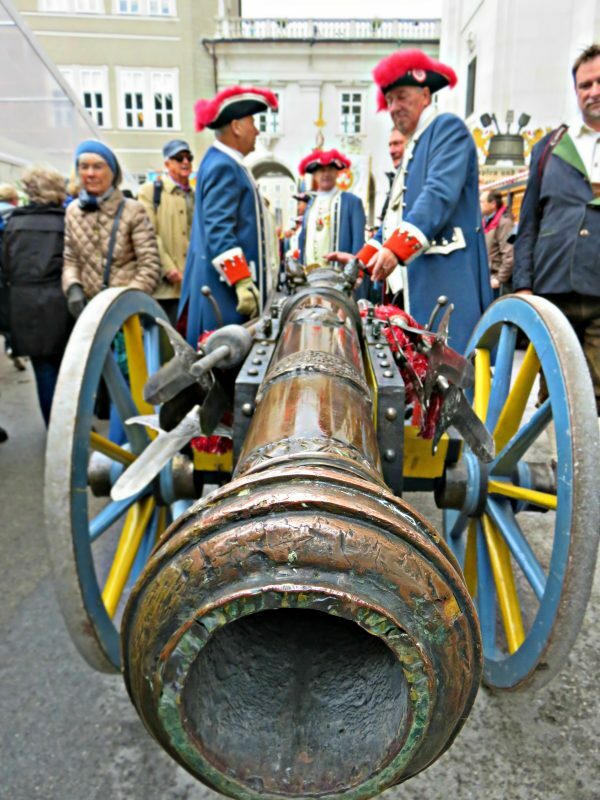 On Domplatz outside Salzburg Cathedral, the ceremonial cannon was fired with deafening rapidity marking the start of the festivities. After the final shocking bang, a momentary silence was replaced with a murmur of excitement, as Salzburgers turned their attention back to their steins or to trying the local produce on offer. The fair weaves in between the intricate Baroque architecture of the Alstadt’s (old town) squares. This dramatic and elegant backdrop provides an alternative catwalk for all the Converse-wearing teenagers in Lederhosen heading towards the vintage fairground rides and the couture-like adaptations of the dirndl worn by Salzburger ladies. Speaking with festival-goers, it was clear that Tracht reflects modern Austria with a new-found interpretation of traditional culture in a fun, creative, and patriotic way. “All my family are wearing it today but each of us puts our own take on it,” one student told me, gesturing towards her siblings. Young designers, such as Lena Hoschek, must have shared that same view growing up. She tailored her first dirndl at the age of 13 with the help of her grandmother, before going on to become an international fashion designer. Hoschek has brought her own unique take on the dirndl to create several cutting-edge collections that celebrate and accentuate the traditional style and the ultra-feminine hourglass shape. In the same way Tracht has inspired young designers and a new generation to adapt and evolve Austria’s traditional dress, Salzburg’s history of brewing beer has resonated with young creatives keen to present their own brands of craft beer. Around the fair, flags fluttered above the stalls bearing the names of Stiegl, Hofbräu, Die Weisse, Trumer Pils, Gusswerk—a mix of mostly family-owned breweries from across the region, all with their own story to tell. “St. 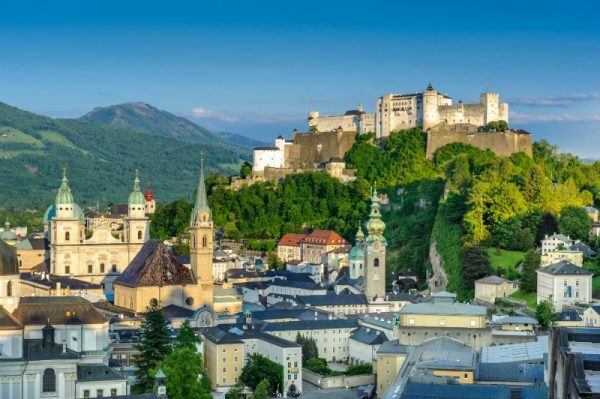 Rupert’s fair is still warming up, so if you want to try one of the best and oldest beers in Salzburg then we will reach it from up there,” our guide says, pointing towards the imperious HohenSalzburg Fortress. Atop Mönchsberg mountain, the castle has watched over Salzburg’s UNESCO World Heritage status centre since the 11th century. It commands dramatic views to the distant, snow-capped peaks of the Alps, one of which is the Untersberg Mountain rising to 1,972 m from the nearby town of Grödig. The peak of the Untersberg was visited earlier via a vertiginous cable car that gently rocked us breathtakingly close to the jagged cliff face, before rewarding us with a full sweep of Salzbergerland. From HohenSalzburg Fortress we followed a forested path that stretched north along the ridge line of the Mönchsberg towards Mülln and the Augustiner Brewery, presenting glimpses and alternative angles of the city and the fortress through the treeline. 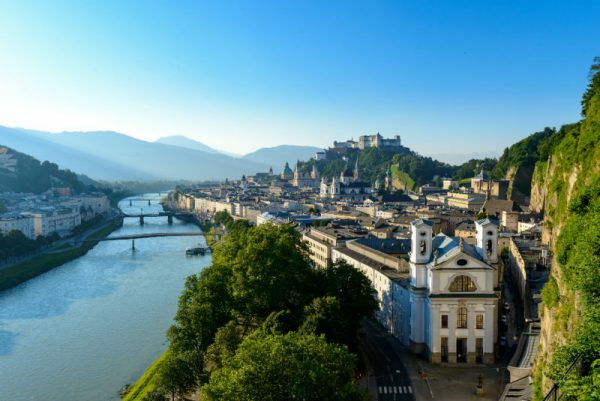 The most photogenic perspective of the city was from the terrace of the Museum of Modern Art, capturing the Salzach River that cuts a meandering path through the heart of Salzburg. This fast-flowing river has always been fed by the glacial waters of the Alps, and the pure mountain water has sustained Salzburg’s brewing heritage. 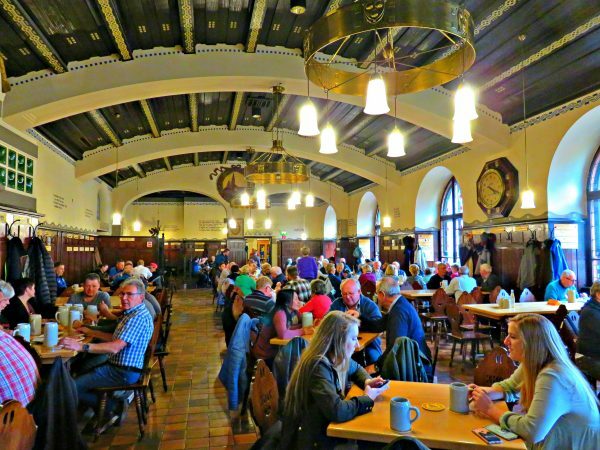 “Since its foundation by the Augustinian monks in 1621, the monastic buildings have remained on the northern slopes of the Mönchsberg,” our guide mentions as we descend a grand staircase inside the Augustiner Bräu. This leads to the Schmankerlgang, the name given to the delicatessen arcade, from which regional specialities are purchased. We lifted a ceramic stein from the rack before waiting for our Bräustübl beer to be drawn straight from the wooden barrels. 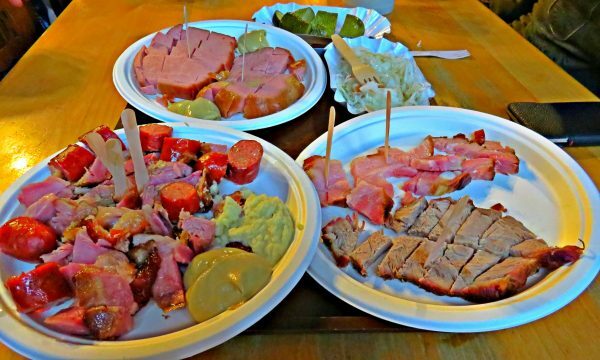 With steins in hand and a platter of cold cuts, we snaked between the happy revellers and joined one of the many communal tables in the Stockhammersaal, the largest of the five halls. Here we meet one of Salzburg’s young craft beer brewers who comes to Augustiner brewery regularly and for several reasons: “Firstly for the social and friendly atmosphere, but also to feel inspired from a place where brewing has been taking place for centuries and to think that the municipal water from the mountain is still used to help create the distinctive flavour of the Augustiner beer,” he says. 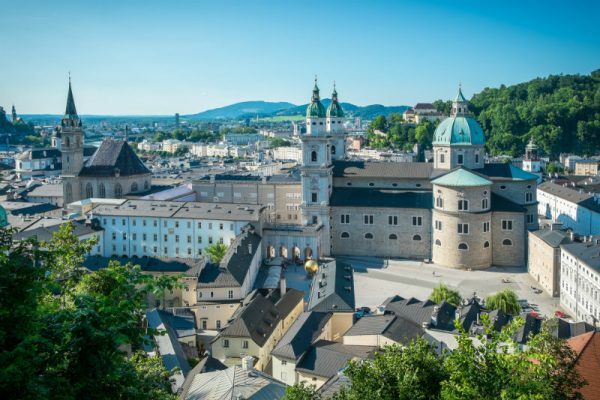 He puts his enterprising spirit down to the fact that Salzburg was an independent state from the 14th century to the early 19th century, and has a history of protecting and preserving the traditional arts and culture that is still handed down through the generations. “This autonomy may well still exist in Salzburger psyche, if not on the map,” he confides. Maybe that is what made a visit to Salzburg during St. Rupert’s festival so special, as the true nature of the city is on show and you may well see just how fashionably traditional Salzburgers really are. For more information on holidays in Salzburg and Austria, visit www.salzburg.info and www.austria.info. Fortunately, jet lag doesn’t have to affect your vacation. Here are a few simple ways to help you deal with jet lag while traveling.